When we read on Pureglutton about her losing and finding her favourite Fish Head Noodles, we heaved a big sigh..
Sighhhhh. When were we going to be as lucky as Ms. Pureglutton and find our Lost Sweet and Sour Pork Man, we wondered. If only the stars look upon us as favorably and reveal the whereabouts of.. the BEST Kow Low Yoke (sweet and sour pork) on earth! Anyway, if you know Pureglutton, you will know that she has pretty excellent taste in food, so being Cumi & Ciki, we just had to go sniff out that trail for ourselves. Mr Mak was not hard to find. 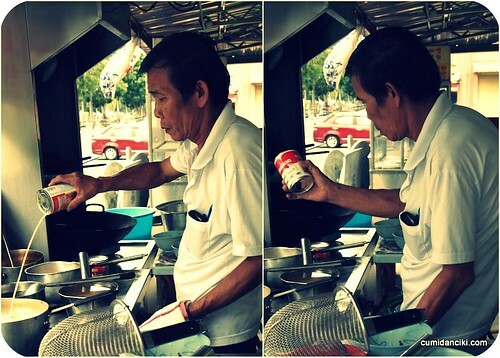 His coffee shop is named Restoran Kopitiam Que-up and if you follow Pureglutton’s directions you will find it easy. You can actually see the huge sign from the main road but you will need to double back for the turning as it will be on the opposite side of the road. There you see Mr. Mak using that special ingredient that transforms the sweet fish broth into a murky white whirlpool of hidden pleasures. Evaporated milk! Mr Mak’s Fish head noodles is different from other fish head noodles because it is not as sour. He uses very little, if any at all, of that souring agent- Ham-choy (salted vegetables) in his concoction. Still the soup is rich, creamy and full of aroma, minus the sour edge. There is a selection of noodles to choose from but we picked the fatter “lai fun” (rice noodles) and this was excellent. Chewy and springy, it was the perfect thing to go with the generous amount of fish head, fish fillet, tomatoes,vegetables and tofu in the broth. 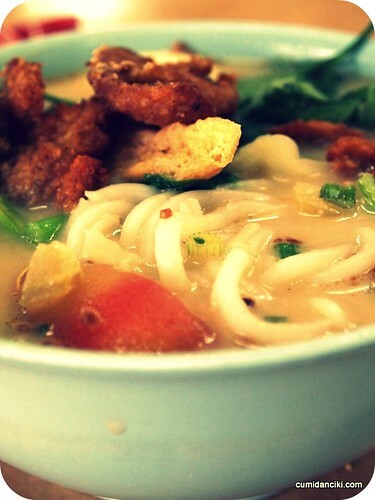 For just RM6.50, the tomyam is bursting with expensive ingredients. 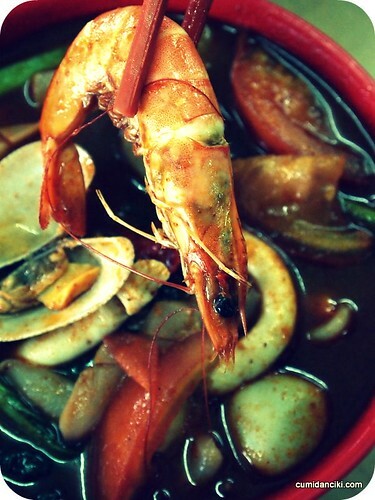 Massive prawns, clams and fishballs, this Tomyam noodle is really spicy and strong tasting. The noodles you see here are the fish paste noodles. Fattest of all the noodles in size, it has a fishier taste than the normal rice noodles. Delicious. Highly recommended. 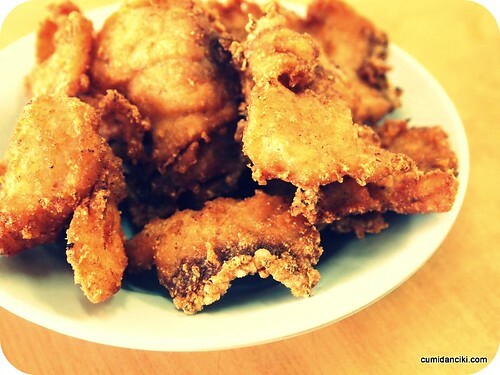 Crunchy and delicious but ours was a little over fried and too salty. That’s what you get for arriving late. We got there around 2.30pm! Not much of a queue but most of the good stuff was finished. Mr. Mak’s is a great find. Thanks for sharing the love , Ms. Pureglutton. Much obliged. Subang Perdana Court 2 in USJ. i like the “effects” you put onto the picture! sadly fish head noodles in melbourne, i can only dream.. Description of missing pan mein uncle and aunty. Err…Err…Very grumpy and grouchy, won’t look up when they take your order but miraculously order will appear on table. *dang* this was all before the advent of the digital camera, so no pics! Is the description enough for watson to help look for missing pan mein uncle/aunty? LOL. ayam still on the lookout for your kow low yoke. ROFLMAO !! Unka.. i know i know! I’ll help u find yours if you help me find mine! really? add this one to the list please ! Oh wow, remember reading this on Pure Glutton’s too and made a big mental note to go and down a bowl or two! It sounds pretty easy to locate, even if the rest of USJ is one big foreign country to me! I think I’m going to hit it this weekend! oh yar.. bummer but nevermind.. next time it is! hi dave, the soup is delicious! will take you one day! USJ is like Cheras to me. Like Foreign. Hardly venture into it. But i like a good Fish Head Noodles. Perhaps it’ll tempt me there one day. ONNNNNEEE DAY!! Love those in KL with lots of evaporated milk, as opposed to the ones here in Ipoh. More like clear broth. yea, the milk is the killer ingredient.. MUST HAVE i tell ya!! Leo .. good place huh? lets go again soon! well…got a really nice one if you like Fish Fillet as mush as I do (compared to fish head). cassian kitchen cafe at Subang jaya SS15 is really very good. big fish fillet, really special noodle they use, soup also very tasty too. just great. Best is what I can say about their Noodle.